Brilliant, just brilliant. I just love this series so much, started somewhere in the first season, then was hooked immediately and I am now with the horde of people waiting for season 3 to come out! Before we start, I have a WARNING: Be sure to watch the entire series (it is now at season 2, everyone is (im)patiently waiting for season 3) or else this book will spoil you on events happening in season 1 and season 2. This book is written in a delightful way. There are several fonts and each one presents a character. We have 3 important characters: Star, Marco, and Pony Head (bleeeeh). Star and Marco write the most, but at times, true to form, Pony Head butts in and writes her own stuff. I was definitely not happy with seeing Pony Head. She is the least likeable person to me on the show, I would shove her in the same category as annoying Glossaryck, or Ludo. She is just too mean, thinks she is always better than everyone, insults everyone left and right. At least in the book form I don’t need to hear her annoying voice, thank heavens! So, I got that out of my system, let me start with the good stuff, and there is so much that I will just list them! *We got dating, inter-dimensional or normal. 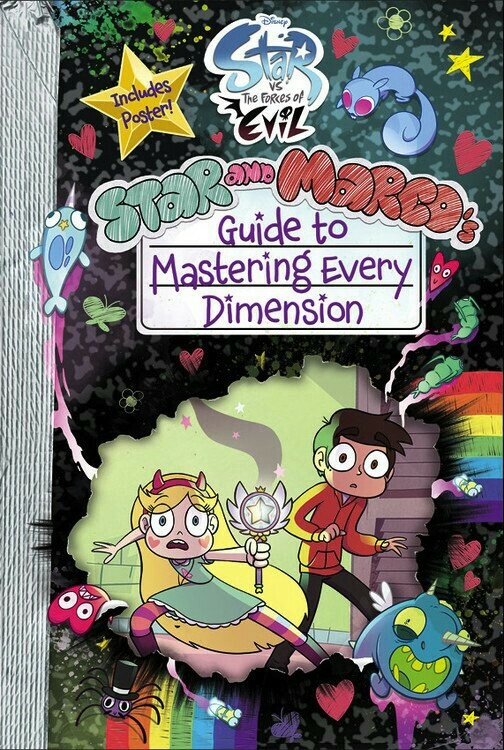 Not only for Marco, but also the teacher, for Janna, for Jackie, and several other characters. *We got advertisements for hoodies (red ones of course), but also others. And introductions to the two schools. *A greetings from inside of your spellbook. With pictures, spells, and even a phone book addition so Star could call people from the magic council. *All about Mewni (and I just adore the map at the back). *Date, Marry, or Make Disappear Forever (or as it is in Star’s world: Court, Betroth, or Sell). The answers were just hilarious, as were the options. *A lot of fun information about the characters and everyone’s remarks about them. *There is some added mystery as we dive deeper into the world (for instance about Heinous and what she has on her cheeks). *And a ton of other things. I also love how this book looks like it has gone through a lot. From weird, mysterious stains (often also commented on by our duo), to rips, ink blots, drawings, and much more. It was also so much that I could just imagine Marco and Star talking while reading this one thanks to the format of them going back forth with what they say, plus Marco’s butting in, I could just imagine that perfectly as he does that in the animated series as well. I could list infinite more stuff that I loved about this book, but let’s just keep it easy: everything! This book grabbed me and held me, sadly I had to stop for a bit because of work, but after that I sprung back again and read on! The ending was brilliant, typical Star, as soon as she doesn’t want to do anything, she just drops it. Thankfully, we have Marco to fix up the mess. Plus extra bonus points to the lovely smell of the paper in this one. Sorry, I just love sniffing books! And I appreciate it when a book smells delightful! So I would highly recommend this one to everyone, again be sure to watch the series first! As for me? I am hoping for more books, as I said at the beginning of my review.